Well, three years later it turns out that healthtech (now more often referred to as “digital health”) continues to boom (more on that below) and my journey has taken me to an unexpected place. I’m happy to announce that I’ve officially joined the Blueprint Health team as of December 1st as Executive Director in charge of the Accelerator program. In my role I’ll be leading the effort to find great startups, run our 12-week program, and support Blueprint portfolio companies as they improve health care for all. While I am technically new to the Blueprint team, I have a long history with Brad and Mat. I (along with the members of Health 2.0’s NYC team) was the first co-tenant at the Loft and remember when much of the space was off-limits in the early days (and for good reason!). Over the last three years I’ve mentored and advised many of the companies coming through the Accelerator program and have developed personal relationships with many of the founders. While at Health 2.0 I also worked with the Blueprint team on a number of important projects (such as Pilot Health Tech NYC) that have helped grow the digital health ecosystem in New York and beyond. 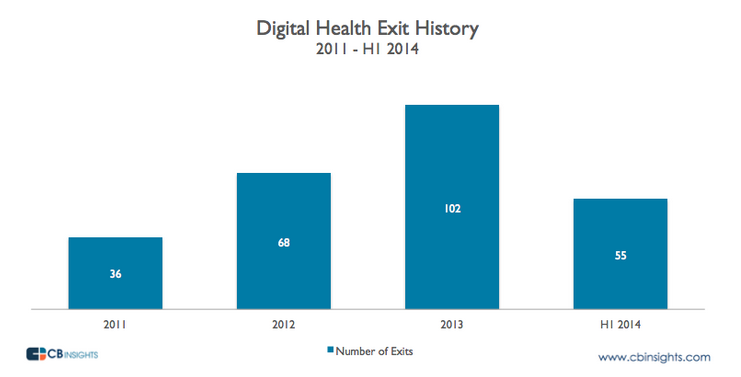 Back in January 2012 it FELT like something big was happening, and as we close out 2014 the evidence shows that something big IS INDEED happening in the digital health space. Since my blog post we’ve seen investment in the space take off, with growth increasing every month, including $2.3 billion in venture investments alone in just the first half of 2014 (see graph below). In addition to increasing investment in the space, we’ve also seen digital health startups gaining traction in the market, as providers, payors, pharmas, and employers (helped greatly through relationships offered by organizations like Blueprint Health) seek out digital health solutions that can address pressing business concerns. Finally, investment in the space and growing market traction has increasingly been rewarded by meaningful exits, with digital health M&A activity on pace to break records in 2014 (see graph below). Blueprint has also grown significantly since that fateful launch day three years ago. We’ve graduated six Accelerator classes to date, with a seventh class getting ready to go in the next few weeks. In total, we’ve helped accelerate the growth of 53 companies addressing a broad range of health problems including medication adherence, specialist referrals, hospital purchasing, and care transitions, among others. Of those 53 companies, 85% are still in operation and, of those, 85% are generating revenue, a sign that our efforts have create sustainable value. Health care has largely been delivered in the same way for decades and I think there are many opportunities to rethink how providers and patients interact using new technologies. I think communication, information, and automation technologies, applied properly, can dramatically reduce the cost of care, improve the patient experience, and deliver high quality. While the fee-for-service model still dominates, there’s no question in my mind that the existing payment system has to evolve in the very near term. I’m interested in value-based payment paradigms as well as other new payment arrangements that emphasize value over volume. We’ve been talking about consumerism in health care since the 1980s, but it’s clear that consumerism is finally growing as a movement. With health care costs increasingly shifting to the patient (20% of U.S. lives are now enrolled in high-deductible health plans and HDHP growth is estimated at 15-20% per year) there is a great opportunity to help instill market discipline in an industry that has long resisted change. Nurses, doctors, and pharmacists have a front row seat in the health system and an intuitive knowledge of how it works, and many of them have great ideas about how to address the problems they’re seeing. Unfortunately, there are relatively few providers building digital health companies and we need to help “intrapreneurs” (providers innovating within the health system) become “entrepreneurs” so they can use their advantaged perspective to build solutions to important problems. In many places, particularly Silicon Valley, it seems that youthful founders are viewed as having a competitive advantage when it comes to building startups. In the health care space, however, it helps tremendously to have relationships, experience, knowledge and a few gray hairs on the head (if you still have any left) when you’re tackling a health care opportunity. We need to help older entrepreneurs, who often have real-life responsibilities (family, mortgage, etc.) that make them adverse to risk, build digital health companies. The need for health care is universal, affecting every racial, ethnic, and social group in our country, but unfortunately, there are very few people in underrepresented minority groups working in the digital health space at this time. The same factors that are limiting minority participation in the digital health space are similar to those in the general technology industry, and can be addressed in similar ways. We can and should do more to welcome talented people who can bring a diverse perspective to the digital health space. Finally, I’d also like to point out that I’m an entrepreneur at heart, having co-founded three health startups in my career so far. Borrowing a page from the great Sy Sperling, I hope to be not only the head of the Accelerator program, but also a participant in the next class, developing an idea along with the other portcos. As mentioned above I’m passionate about changing the way health care is delivered and experienced, specifically as it relates to concierge medicine and direct primary care, and I hope to be able to use Blueprint resources to develop an idea I’ve been kicking around for a long time. As a closing note, I’d like to put in a plug for the program. We’re coming to the end of the search process for class #7, so if there are any great digital health startups that might be a good fit for our Accelerator please have them apply ASAP. The program officially kicks off February 2nd, 2015 and will run through Demo Day on April 23rd, 2015. Something Big Is Happening Here. Join us at Blueprint Health!